Eliot Coutts leads skateboard kids in a technique and safety clinic at the skatepark. One foot forward, one foot back. That’s what kids were told by Eliot Coutts at the Skate Jam on Sunday held at the Martha’s Vineyard Skate Park. The young skaters held onto the instructions tighter than their parents’ hands. Some found their balance right away, while others did not. But ride or fall, everyone found a quarter-million dollar reason to smile. 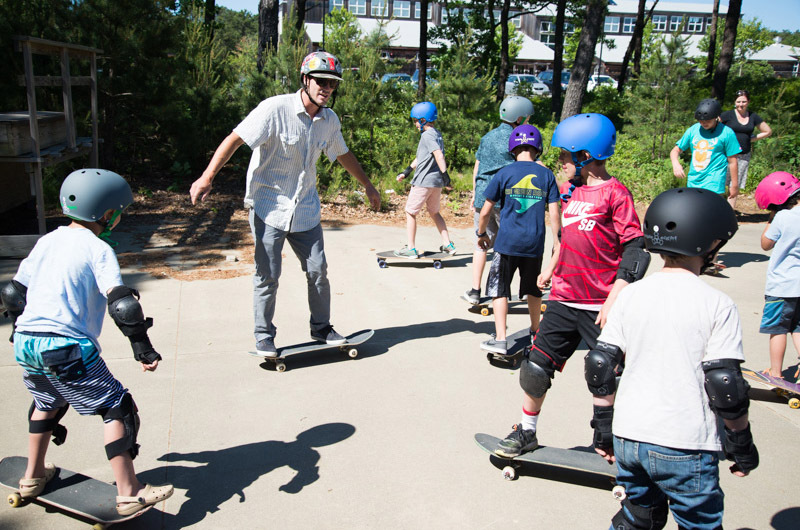 Earlier this spring the Martha’s Vineyard Skate Park received a $250,000 expansion grant from MV Youth. The Father’s Day event was a celebration of the future of the park, and the next generation of skateboarders. Skate park association program director Eliot Coutts began the celebration with beginner lessons for children of all ages. A barbeque carried the celebration into the evening as older skaters took the stage, showing off more complicated moves for crowd. 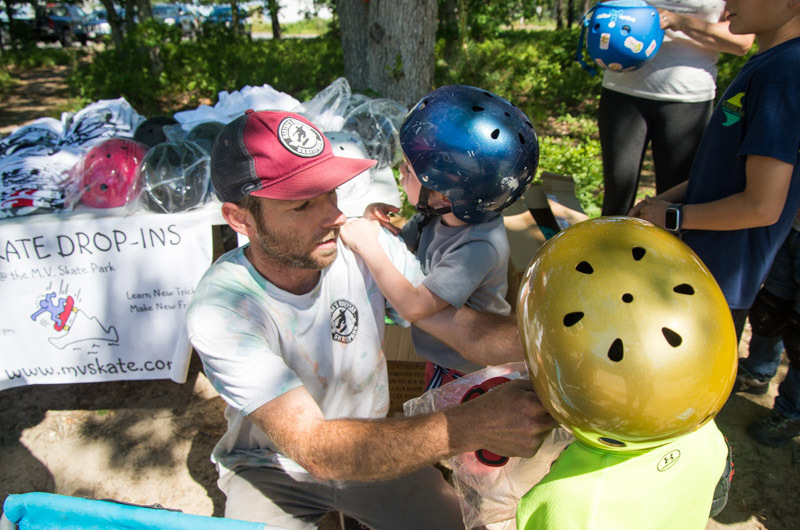 The festivities also offered free helmets to raise safety awareness. The skate park association operates as a nonprofit and works with the town of Oak Bluffs, which owns the land, to administrate the park. The association cleans and maintains the parkland, and during summers offers drop-in clinics for skaters ages seven and older — Monday through Friday from 8:30 a.m. to 12:30 p.m.
Lisa Magnarelli-Magden said she frequently brings her three children to the skate park throughout the year. The skate park association plans to complete the more underdeveloped zones of the park lingering from the original construction in 2003. The wooden ramps are expensive to maintain, he added. The renovation will replace the wooden structures on the park’s perimeter with a long-lasting concrete design. Plans also include creating a five-foot horseshoe shaped half-pipe extending toward the Martha’s Vineyard YMCA, said skate park association president Erik Albert. The group also plans to add more stairs and rails at the front of the park without ruining its inclusive charm. Construction on the skate park begins in October. The drop-in sessions begin on July 9 and continue through August 26. Wonderful event! We had a blast! Looks like I'm going to be purchasing skateboards for my sons real soon. It's nice to see that a local guy who grew up on this island giving back to the youth of this island My hats off to Elloit Couts and Erik Albert for not letting this treasure of our youth disappear and for making it better for generations to come Remember kids don't forget those safety helmets!! Skate on!!! This is a nice event for the kids to attend and maybe one day in the future they will become a Darren or Lance:http://www.tillys.tv/result/195960-0-66090688 and http://www.tillys.tv/result/195960-0-66090689. My son Cooper really enjoyed the skate clinic this past Sunday. Each time we visit the island, he begs to spend every day at the MV Skate Park! Eric was super friendly and encouraging to both my kids. We were so lucky that this event happened during our summer trip! Thank you guys!